Hall of Fame trainer Bill Mott sent out a talented first-time starter named Hidden Scroll on the Pegasus World Cup undercard, and the Juddmonte Farms homebred blew away the competition to win by 14 lengths while jockey Joel Rosario geared him down at the wire. The sophomore son of Hard Spun ran a mile over Gulfstream's sloppy and sealed main track in 1:34.82, striding his way into the Kentucky Derby conversation with a 104 Beyer figure. There are no strict plans for Hidden Scroll's next start, but Mott indicated that it would likely come in stakes company. Hidden Scroll is a fifth-generation Juddmonte homebred. He is out of the unraced Empire Maker mare Sheba Queen, herself out of the Group 1 winner Etoile Montante (Miswaki). Juddmonte bought into the family with the fifth dam, Nijinsky Star (Nijinsky II), out of the three-time G1 winner Chris Evert, purchasing her for $700,000 at a Keeneland November sale. 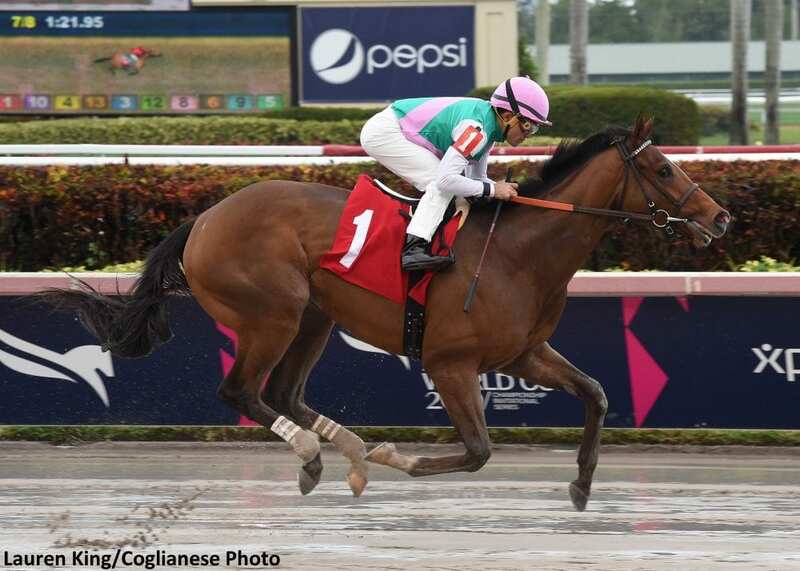 This entry was posted in Triple Crown and tagged bill mott, etoile montante, Gulfstream, gulfstream park, hall of fame, hard spun, hidden scroll, joel rosario, Juddmonte Farms, kentucky derby, nijinsky star, pegasus world cup, road to the kentucky derby by Paulick Report Staff. Bookmark the permalink.